That was the best season so far. I was pleased that they included the final scene with Arya as I was wondering if they were going to get that far along with her story this season. It seems like Benioff and Weiss are closer to my view on which are the most important characters and plot-lines than some other viewers. Since they are adapting with the collaboration of GRRM it’s canonical – they are paring it down to the essential story lines. This is a bit spoilerish for readers since we now know which plot lines in the forthcoming books aren’t important. As a reader I think the three main characters are Tyrion, Arya and Daenerys. Several other characters are crucial to the plot of course, such as Jon Snow and Brandon Stark, but I could never get that interested in their stories in the books. Next season should be very interesting with Arya in Braavos and scenes in Dorne as well it seems. Just ten months to wait… I got the Blu-ray of the first three seasons and season four is saved on my DVR so I can re-watch one episode a week just in time for the start of season five! 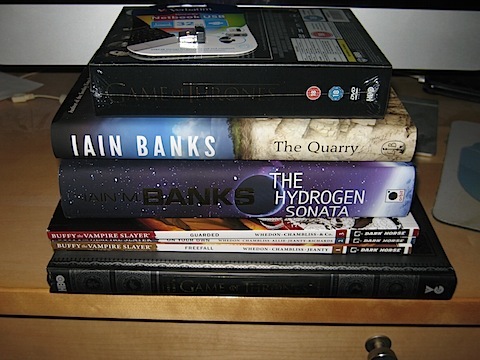 Game Of Thrones season 2 DVD box set, the Cogman Game of Thrones coffee-table book, the first three volumes of Buffy series 9 the comic book and the last two Banks books I hadn’t got. And I got a House Stark official GoT T-Shirt. And on top of the pile is a very small 32GB flash drive. It was announced today by HBO that GoT is renewed for a fourth season. So that’s nice. And I was right in my previous speculation about where some of the changes this season would be made. I’ll have to think about that some more. Don’t decode this unless you have read the third book or you are happy to be spoiled! It contains speculation on some essential changes that we will see in the third season of the TV show. In the first season we see Barristan Selmy leave King’s Landing. He isn’t in the second season at all. In season three we can expect him to turn up in Essos and contact Daenerys Targaryen. In the books he uses a false name and we don’t know who he really is until a much later reveal. In the TV show of course we will recognise him immediately. Will the TV show follow the books and have him reveal his identity much later or, since it’s already spoiled, do it sooner? the character who seems to get killed off near the end may turn out to be magically saved in the next volume. So in fact there wasn’t a death of a major character after all. But we won’t know for a couple of years. Well. That managed to surprise me. More than once. 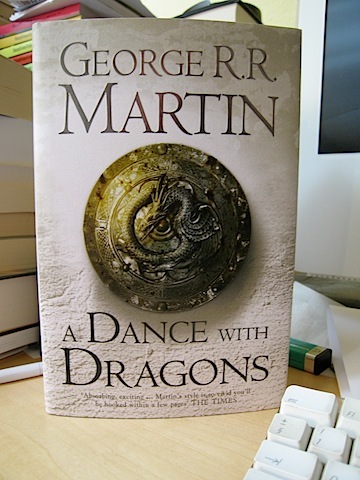 Today I finished rereading A Feast For Crows and am about to start A Dance With Dragons. It’s more than likely that one of the remaining major characters gets killed in this book. That means Jon, Dany or Tyrion. If none of them die then, hey!, maybe they will all make it to volume seven. I don’t see Arya or Sansa (is she still alive?) getting bumped off this volume because they haven’t actually got anywhere yet. I think Tyrion is the least likely to die, and Dany would be the most annoying to me. After the awesome finale of the TV show Game of Thrones I started rereading the books to get up to speed for the fifth volume which comes out in a few weeks. So far on rereading for the first time after nearly five years it’s remarkable how closely the TV series hewed to the first book, A Game of Thrones. Lines of dialogue were lifted exactly from the book, and many others just shortened a little. Much closer than any other adaptation I can think of, and the better for it.